As you prepare your training plans and consider your racing schedule, if you've got an Ironman race on the calendar, you're trying to decide how much time to spend swimming, biking and running during the year. 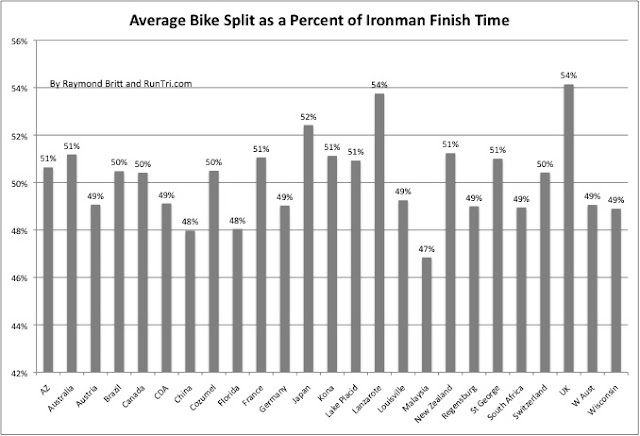 One of the factors that should influence your thinking is this: your Ironman bike split may very well end up being 50% of your total finish time. Half your Ironman race will be on your bike; be ready! Of course, as shown in the chart, there is some variation by race, but for the most part, the 50% rule holds. Same is true for half Ironman 70.3 races, too: 50%.